Homemade Cheesy Lasagna is one of my favorite dishes to eat and to make. I’m guilty of making super quick and easy meals but when I have the time, I love to make this for dinner. Now that I think of it, I’m not really sure why I don’t make it more often; it really doesn’t take a lot of active time and I love to create my meals from scratch and my family does, too! Using fresh parsley is important in making this dish. Not only does it make the sauce smell amazing but it also gives a wonderfully fresh taste to the dish. In addition to the fresh parsley, an important step to this dish is to let the sauce simmer. It’s always flavorful and delicious, and honestly, you just can’t beat a homemade dish. After baking, let the lasagna cool for about 15 minutes before serving. It will result in the ability to portion it off without it spilling everywhere. I think we’ve all made that mistake of serving lasagna as soon as it comes out of the oven. Let it rest, it’s worth it! 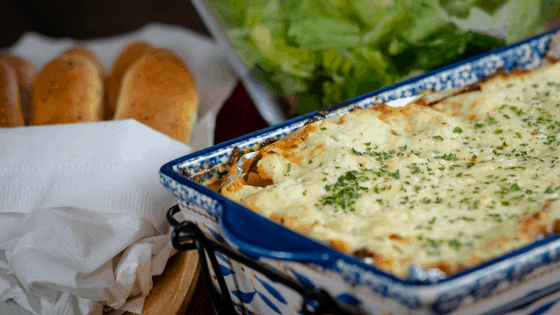 If you’re serving sides, garlic breadsticks and caesar salad are perfect to serve with this homemade cheesy lasagna. By garnishing the top of the lasagna, it adds to presentation and makes for pretty plating when serving guests. My family gets excited when they come home to the wonderful smell of melting cheese and simmering tomato sauce. Presumably so, it’s a meal that our family enjoys and I hope your family will love it, too! Check out my RECIPE Page for more delicious recipes that are family friendly and follow me on Facebook to stay up to date! PIN THIS IMAGE to your Pinterest board! This homemade cheesy lasagna is flavorful. The key to full flavor is letting the sauce simmer and using fresh parsley. Preheat oven to 375° and line 9x13 dish with aluminum foil and spray with non-stick cooking spray. Brown beef and Italian sausage in large pot. Drain and crumble. Add in garlic, onion, sauce, paste, and diced tomatoes and mix well. Add in 1 tbsp sugar. Add salt, pepper, and parsley to taste. Simmer on low, stirring occasionally for about an hour. Slowly stir in ricotta cheese and until well blended. In prepared 9x13 dish, Spread half of the meat mixture in dish. Spread half of cheese mixture evenly across noodles. After topping with remaining cheese, spread evenly and cover dish with aluminium foil. Remove aluminum foil and bake for about another 15 minutes. Just until tops have browned. This looks absolutely amazing! How yummy! This lasagna looks so cheesy and delicious, I can’t wait to try it! Yum! I love a good American-Italian Lasagna, I know it may not be what my immigrant grandparents enjoyed in Italy, but darn it I love all the cheesy goodness. I have had long lectures from family members on “How they used to have it”, however, both are fabulous if made right and yours looks AMAZING!! Keep those awesome American Italian Lasagna recipe coming I really enjoy them!! That’s Italian comfort food I know I could surprise my hubby – but only after biking some extra miles;) It looks delicious! I love a good lasagna recipe. Especially with lots of cheese! This looks so delicious and inviting 👌 itd been ages I have made a lasagna at home..time to change that!